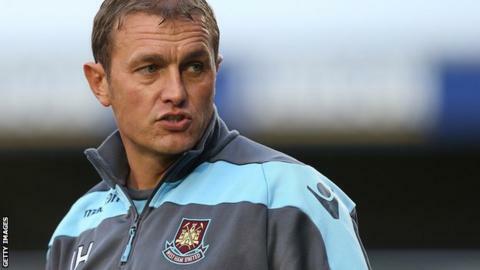 New Leyton Orient boss Ian Hendon says his time coaching at West Ham has prepared him well for management. Hendon, 43, had been the Premier League club's first-team coach since 2012, working alongside outgoing Hammers boss Sam Allardyce. "You can't fail to learn from Sam, with the way he is and his organisation," Hendon said. "It was an eye-opener and I took so much from him. Sam was fully supportive and I am ready for the challenge." Hendon had a spell as Barnet manager between January 2009 and April 2010 and, after a stint at Gillingham as assistant manager to Andy Hessenthaler, he joined West Ham in 2011 as development squad coach. He was appointed Orient manager on Thursday on a two-year deal. "I wouldn't say I've improved [as a manager]," added Hendon, who spent almost four years with Orient as a player. "I've learned a lot more. I know I did a good job at Barnet in the circumstances and I have no regrets. "It was a good learning curve for me and I want to prove I am a good manager. I couldn't think of a better club to be manager of than Orient." Orient were relegated from League One last season, having had four different managers over the course of the campaign. O's chief executive Alessandro Angelieri hopes the club can now find stability. "The last 12 months was an experience for us," the Italian said. "We made some mistakes and we don't want to do the same mistakes next season. We want to turn the page and we have a new, blank page." Hendon says one of his first tasks will be to persuade striker Chris Dagnall to sign a new deal with the club. Dagnall, 29, scored 13 goals in 42 appearances for the O's last season. "Chris is one of the players we would like to keep," he said. "That will be top priority, to speak to him and see what he wants to do. I'm sure he's had offers from a lot of clubs but from what I hear he likes it in London and loves it at Orient."